You created your account, set up your payment settings, and created your first campaign. Now you want to add images to the cause&apos;s story. You search and search and there is no image gallery option to be found. Don&apos;t worry. While you can&apos;t upload additional images (aside from the featured image) to The Chesed Fund. You can add more images to your cause&apos;s story. 1 ) In the causes page on your dashboard, click on the cause that you want to edit. This will show you the "edit cause" page. 2 ) Find the Story box and look for the button the looks like an image. 3 ) Click the image button and you will see a drop-down where you can paste a link to any image on the internet. 4) Click the checkbox, and the image will be added to your campaign! 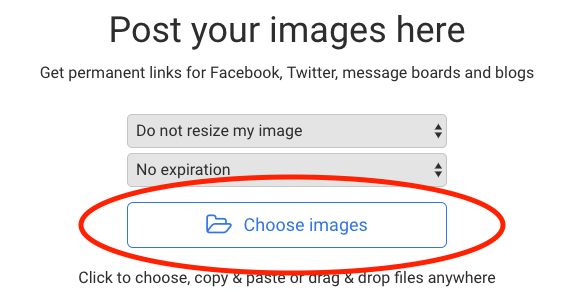 You can upload images to an image hosting service and include them in your campaign. 1 ) Navigate to https://postimages.org/. 2 ) Click or drag-and-drop your image on "Choose Images"
3 ) Click the copy button on the right side of the second link that appears labeled "Direct Link"